They never found her sister's body, but Detective Rebecca Montgomery knows her murderer is still out there. In the five months since Danielle went missing, there have been two more brutal abductions. A savage menace stalks the women of San Antonio, and the relentless detective will do anything to find him. But her latest case—the discovery of a young woman's remains inside the wall of a burned-down theater—plunges Rebecca from her grief into a brand-new nightmare. She soon meets handsome, mysterious Diego Galvan at the crime scene, and his shadowy connections will lead to her first break in both cases. But when Rebecca submits to his considerable powers of seduction, she will leave herself vulnerable to a merciless killer . . . and when he attacks, no one will hear her scream. 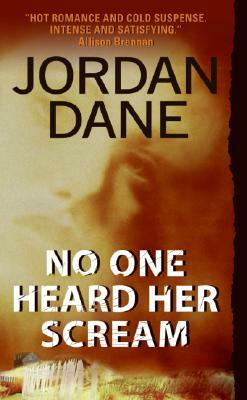 Ripped from the headlines, Jordan Dane's gritty suspense plots weave a tapestry of vivid settings, intrigue, and dark humor. A thrilling ride of mystery and suspense–all in the first degree! She's a member of Romance Writers of America, Mystery Writers of America, Sisters in Crime, and the International Thriller Writers. Jordan and her husband share their Oklahoma residence with an intelligent canine and two cats of highborn lineage.